Fragrances seem harmless enough right? They are, after all, just “smell”. Well, I hate to burst your vanilla-scented (which is actually ‘pyperonal,’ originally created to be a lice killer) bubble, but you know that if I’m writing about it, it’s probably bad. Believe it or not, fragrances are some of the most dangerous products on the market today. Not just perfume, but anything with a scent can have serious negative effects on numerous parts of the body, both inside and out. It is against the law to sell any commercial product without an ingredient list that catalogs all of the elements inside. But, while the label might simply say a product contains “fragrance,” that innocuous catchall can mean that there are over six hundred additional synthetic petrochemicals. Manufacturers are not required to list the specific chemicals in their fragrances because they’ve convinced legislators and government agencies that these ingredients are trade secrets. Of the 5,000 different chemicals used in fragrance products, less than 20% have been tested and reported as toxic. The federal government regulates many of those chemicals that have been tested as hazardous materials. The remaining chemicals have not been toxicity tested, so the health effects and regulatory potential are unknown. Studies show that fragrance chemicals can cause health effects, primarily at the skin, lungs and brain. Many studies have been conducted to show that fragrance products can cause skin sensitivity, rashes, and dermatitis. In fact, skin sensitivity is one of the best-known side effects of fragrances. A number of studies have been conducted to show how fragrance affects the brain as well. Because of the strong connection between scent and memory, we know that fragrance products can cross the blood brain barrier. This is important because it means that fragrance chemicals have the potential to affect, and possibly damage, brain tissue. This kind of effect is called ‘neurotoxicity.’ For example, Linalool, the most abundant chemical in perfume and fragrance products, is known to cause lethargy, depression, and life threatening respiratory effects. Fragrance chemicals can enter the body through inhalation and ingestion through the nose and mouth, and absorption through the skin. Once in the body they are absorbed into the bloodstream and transported throughout the body. Individual sensitivity to the effects of fragrance chemicals varies widely from no effect at all to severe symptoms. Symptoms experienced by some people include: headache (migraine especially), sneezing, watery eyes, sinus problems, anxiety, nausea, wheezing (especially in asthmatics), shortness of breath, inability to concentrate, brain-fog, dizziness, convulsions, sore throat, cough, chest tightness, hyperactivity (especially in children), tremor, fatigue, lethargy, and drowsiness. Children are even more susceptible than adults to the effects of fragrance chemicals, yet fragrances are added to nearly every baby product on the market. A parent who wears perfume or uses scented products may well be poisoning the air their children breathe. Exposure to fragrances may result in the child having difficulty concentrating, learning disabilities, hyperactive behavior, and even growth retardation and seizures in extreme cases. Even though there are outward symptoms that can be evident, there may also be symptoms that we cannot see. We know that many chemicals can cause birth defects (both subtle, like learning disabilities, and overt, like limb deformities) or make changes in DNA, but it is often difficult, if not impossible, to link those effects to a given exposure. If you really insist on wearing fragrances, choose wisely. There are many natural perfumes out there; you just can’t buy them from an overly made-up, lab coat clad lady in a department store waiting to take advantage of your naïve nose. Try essential oils, simply the “oil of” the plant material from which they were extracted, such as lavender, rose, eucalyptus, or sandalwood (just to name a few). Since essential oil is typically extracted by distillation, you are only buying a natural component of the plant itself. The scent is pure, deep, long lasting, and they often have many health-promoting effects – just consider aromatherapy! 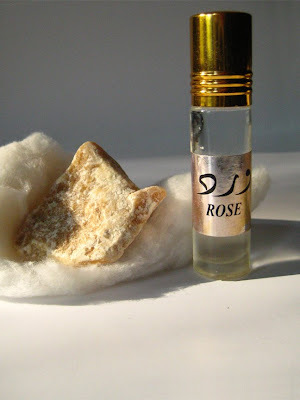 You can also buy perfume oil, which is essential oil typically cut with jojoba oil (a shrub native to the American southwest), since it is colourless and odorless. The vial pictured above is rose oil, my absolute undoing! I bought this in Marrakech since they are known for their high-quality oils, but you can purchase perfume and essential oils at most health food stores. Just ask someone for assistance as each brand ranges a great deal in quality and price. Solid perfume is another great option. The strange looking object beside the bottle is just that – essential oil combined with beeswax, and we all know the benefits of that glorious substance! You will often find solid perfume in a small container of sorts, but this one (also purchased in Morocco) was a rare find. Solid perfume is almost like lip balm, except that you rub in into your pulse points: wrists, neck, behind the ear, base of the throat, temples. This is where the blood vessels are closest to the skin giving off more heat and acting like mini fragrance pumps. The effects of many fragrance chemicals on health are still largely unknown. The fact that different fragrances cause different symptoms (or no symptoms at all) may indicate that some chemicals are more toxic than others. But until all chemicals have been tested, we can’t know which products are harmful, and which are not. Until the time that all chemicals have been tested and the harmful one removed from production processes, it is prudent to avoid fragranced products as much as possible. Afterall, you shouldn’t have to cause asthma attacks and alter your DNA just to smell a little sweeter!